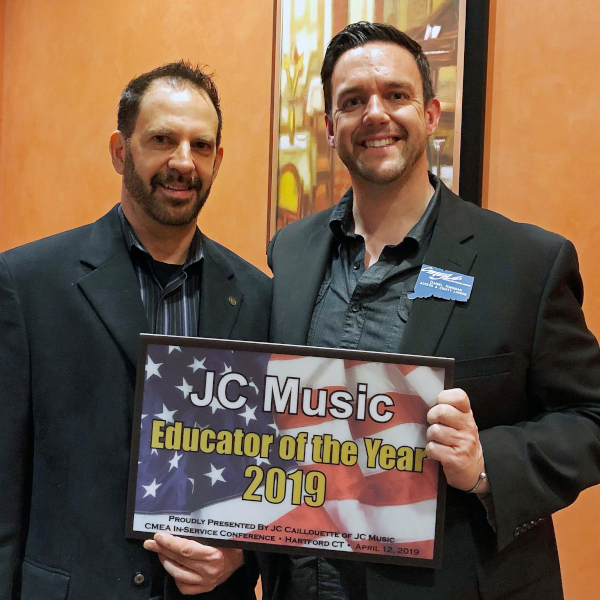 The 2019 JC Music Educator of the Year Award went to Dan Kinsman, from Fair Haven School. The award was presented at the annual JC Music Educator Appreciation Dinner, held in Hartford during the CMEA conference on April 12th. View our Educator of the year Directory! Special Congratulations are in order for Dan Luongo from Two Rivers Magnet School in East Hartford, the 2012 JC Music Educator of the Year! He was presented with his award on April 13th at the CMEA Conference at the Hartford Convention Center. Dan has also been a regular adjudicator for the Solo Competitions in the audition phase as well as the finals! See the JCTV interview featuring him below! The annual announcement took place at the NAFME Eastern Division Conference at the Hartford Convention Center this April. Jason DeGroff was named JC Music Educator of the Year on April 4th, 2014! This award was proudly Presented by JC Caillouette of JC Music at the Connecticut Music Educator’s Association Conference on April, 29 2016. The 2017 JC Music Educator of the Year Award went to Marissa Iezzi, from Hillhouse High School in New Haven. The award was presented at an annual JC Music educator appreciation dinner, held in Hartford on March 31st. The 2018 JC Music Educator of the Year Award went to Steve Fasoli, from Weston High School in Weston. The award was presented at the annual JC Music educator appreciation dinner, held in Hartford during the CMEA conference on April 20th.